Christmas is that time of the year which fills every heart with joy and frolics. Each one us wants to celebrate this festivity with jubilation and also make others feel special on this occasion. One of the ways that we adopt to show love and affection and greet others on Christmas is by giving away Christmas greeting cards. They are a wonderful way to express your love to your near and dear ones and show them your gratitude. This is also a great way to stay connected with the people you care about the most. People go to the nearby store to buy Christmas cards and spend a huge amount of money on the same. However, there is no need to empty your pocket when you can create a card on your own easily with Greeting Card Studio card creation software. Style, fonts and colors: You can either start from a fresh page or choose a greeting card template to start designing your card. 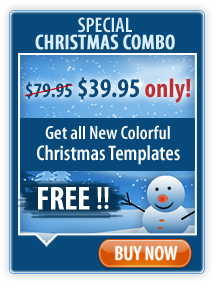 Christmas card templates will help you a lot in choosing the right colors and fonts for your card. Since, the entire design will be in front of you, it will be easier to customize it. You can either use the styles provided in the template or pick your own styles to apply on the greeting card. Insert shapes, symbols or clip art: You can make your greeting card look appealing and interesting by putting various shapes, symbols or clip art from the symbol library. You can add a personal message to your card and put it in a callout to give it a more dramatic effect. This software allows you to pick 'n' number of shapes and symbols to adorn your card design. Insert family photos: To make your card look even more special, you can insert family photos in it. This card maker software allows you to import images from your system and put them into the card design. This will give a more personalized touch to your card and will make the recipient feel special. Publish in different formats: With the use of Greeting Card software, you can publish your Christmas greeting cards in formats like PDF, JPG, GIF, BMP, PNG, TIFF and HTML.